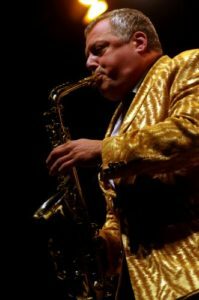 Pete Long Big Band Workshop 19th / 20th October 2019. We are thrilled to announce a two day big band workshop with the one and only Pete Long, musical director of the Ronnie Scott’s Big Band. This is your chance to work with the U.K.’s boss man, skipper, gaffer, guv’nor, top dog, number one, big cheese, big noise, curry lovin’ bigwig of the Big Band scene. Pete has worked with and backed Jamie Cullum, Georgie Fame, Claire Sweeney, Jane McDonald, Sir Willard White, The Birmingham Royal Ballet, Jools Holland, Clare Teal, Joss Stone, Dionne Warwick, Katie Melhua, Mel C and Emma B, Will Young & Seth MacFarlane. Over the last couple of years, Pete’s career has divided into three distinct streams- as an educator, working in masterclasses and as soloist with young musicians all over Britain, from the furthest point of West Wales to the orchestra at the Royal Academy. As a jazz soloist, Pete has appeared with resident trios in the provinces, and has often been caught at Ronnie Scott’s, in London’s West End. It is however, as a bandleader and orchestrator that Pete spends most of his time currently, with work being divided between directing the Big Band at Ronnie Scott’s, and putting together bands of all sizes and styles for clients on a bespoke basis. Sponsored and in partnership with Yamaha Saxophones, Pete brings his immense knowledge, passion, energy and skill to this incredible workshop. Places will be strictly limited and we expect this to sell out, so don’t delay in booking you tickets!